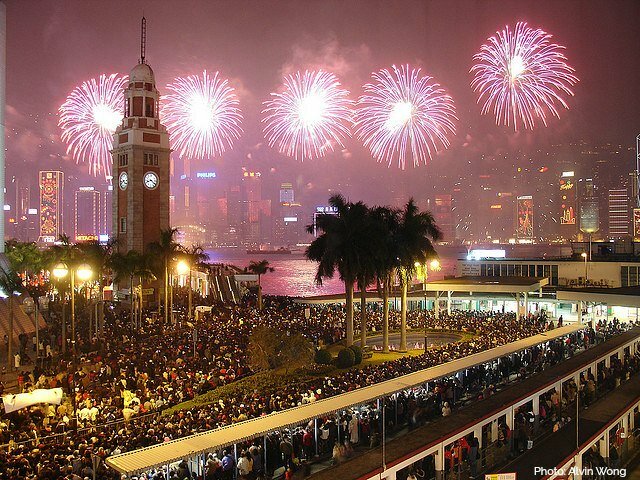 Hong Kong fireworks festivals are legendary, watching as thousands of bright lights explode over the world's most beautiful harbour is simply a mesmerizing experience, one you should not miss if you happen to be in Hong Kong during one of these ocassions. Chinese New Year: The most popular of Chinese festivals, Chinese New Year falls on January or February in the Western calendar. 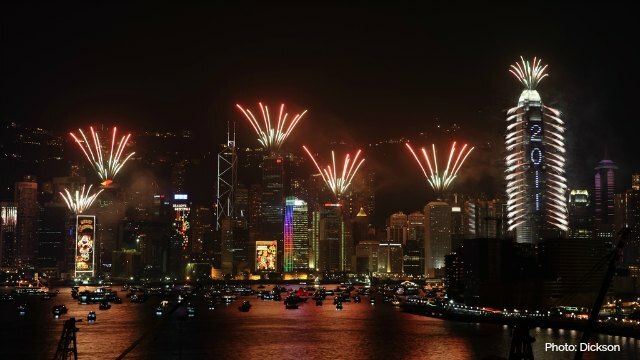 Fireworks are an essential part of the celebrations and in Hong Kong the New Year is greeted with an extraordinary 25 to 30 minute production which can be seen from both sides of the Harbour. National Day: Celebrated on October 1, National Day marks the founding of the People's Republic of China. 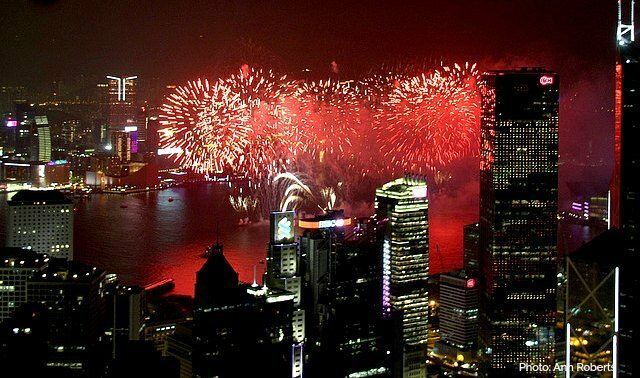 The show is over 20 minutes long and is set off from barges positioned in the middle of Victoria Harbour. 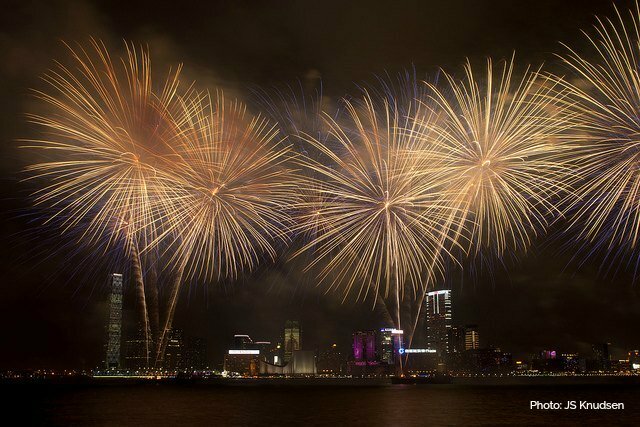 The sparkling show can be enjoyed from anywhere there is a view of the sky above the Harbour, either from the Kowloon or the Island side. New Year's Eve: At midnight December 31 the New Year countdown and a frenzy of shimmering lights and blasts herald the start of the new year. 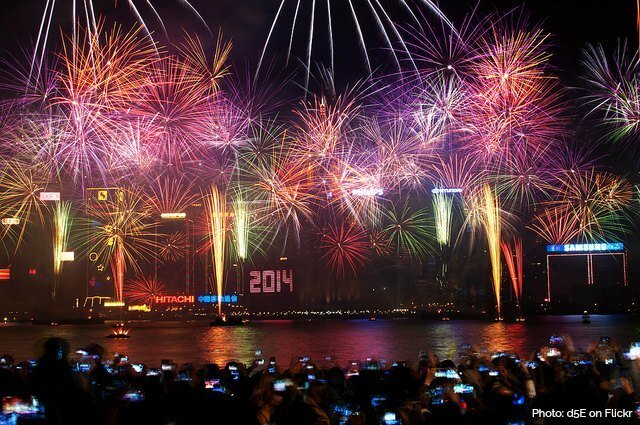 There is a focal point where the countdown is displayed, but fireworks can be watched from both sides of the Harbour. Shorter than the above two, they last about 10 minutes. 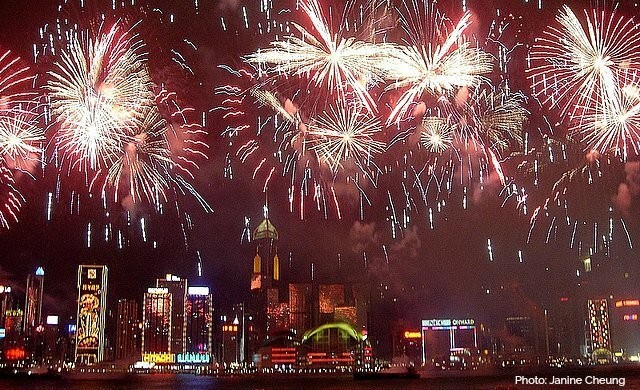 There might be other ocassions that also call for a fireworks extravaganza such as a special anniversary of the Establishment of the Hong Kong SAR, the 10th, 15th or 20th Anniversary were some examples, but fireworks do not occur on a regular basis for these occasions. There are many outdoor free spots from which to watch the fireworks. Keep in mind that any of these public viewing areas will be extremely crowded as hundreds of thousands descend upon the waterfront for the amazing spectacle and electric atmosphere. The Hung Hom Bypass which is closed to traffic from 6:00 p.m. between Salisbury Road and Hung Hom Road or the Hung Hom Promenade just down below along the waterfront. Take the MTR to Hung Hom Station Exit D4, it's about a 15-20 minute walk down to the Promenade. The West Kowloon Waterfront Promenade a little further out west but gives you that million dollar view of the Harbour and since it is a relatively new site, it doesn't get the crowds the other spaces do. Take the MTR to Kowloon Station, exit by the automatic doors next to Exit D to reach Nga Cheung road, followed by a 10-minute walk to reach the MTR Kowloon Station Entrance of the West Kowloon Waterfront Promenade or get off at MTR Austin Station Exit D2, followed by a 20-minute walk to the MTR Kowloon Station Entrance of the West Kowloon Waterfront Promenade. More Info www.westkowloon.hk. 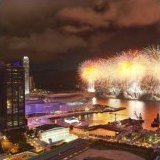 The Ocean Terminal Rooftop Car Park of Harbour City is open to the public to enjoy the fireworks with party admission ticket per person. You can redeem up to 4 tickets per person by purchasing HK1,500 at the Harbour City Mall and a HK30 donation to a designated charity. Check the Harbour City site for details. Getting there: MTR TST station. Along the Central Waterfront Promenade from the Star Ferry Pier to Tamar Park. There are elevated observation platforms and it is also possible to find places along the promenade where the Convention Centre or IFC are in view, these are often the focal point of the New Year's Countdown. The top of IFC Mall. This is NOT the big IFC tower (Two IFC), IFC Mall is the shopping center in between the towers, One IFC and Two IFC, where the Apple Store is. Head over to the Roof Top Garden on Level 4. There are a couple of bars and restaurants, RED Bar and Isola Grill or stock up at the supermarket downstairs. 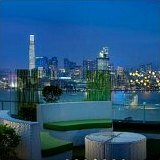 Easy access to IFC Mall from Central Star Ferry Piers, MTR Hong Kong Station, Mid-Level Escalator. One of the many lookout points in the Midlevels or Victoria Peak. They give you a full panorama of Victoria Harbour and don't get as crowded. Head to the Peak earlier ahead of the fireworks time, then walk down the hill to find a suitable spot along the Mid-Levels. There are lookout points on Bowen Drive, just below the intersection of Bowen Road and Bowen Drive and also at the Peak on 33 Plantation Road, just after intersection of Plantation and Findlay roads. 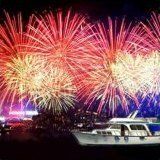 As a general rule, you should watch the fireworks from the side of the Harbour where you are staying and plan on walking. Now that the scope of the fireworks has expanded, you get spectacular views from just about anywhere. Check on each specific event to see what that particular programme will be by following the links below. Once you decide on a place to watch, get there early and have an exit plan Some people arrive as early as noon to stake out a great vantage point and come equipped with picnics, music, drinks, etc. 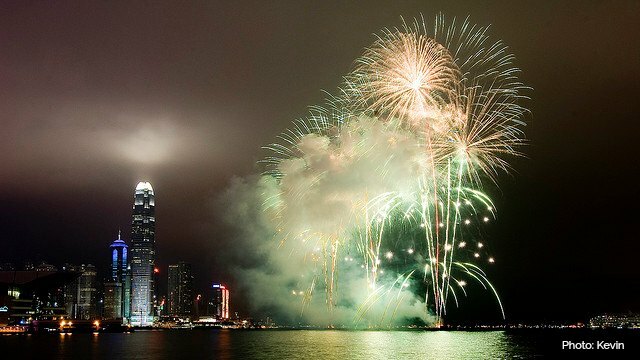 If you are not ready to battle the crowds and much less worry whether you will find a restroom if needed, consider watching the fireworks up close aboard a Harbour Cruise, or from one of the many rooftop bars and restaurants with splendid views, and for the ultimate convenience, watching from the comfort of your own hotel room!